Peter Auret (born 17 August 1976, Johannesburg, Gauteng) is a South African drummer. Peter is a versatile musician who has performed an toured with many of South Africa's great groups and musicians. He also works as a producer, recording engineer and occasional composer at his Sumo Sound recording facility. His distinctive performances and musical ideas can be heard on his, and many others' records. Peter Auret grew up in Johannesburg listening to his parents' Rock 'n Roll and Folk Music records without much exposure to Jazz and African music, in the then still very segregated and isolated South Africa. Although both his mother and grandfather played musical instruments, a career in music was never encouraged by his parents. The largely self-taught drummer began playing at the age of seventeen. While in high school he played in the Witwatersrand Youth Orchestra and the school marching band under direction of South African Pipe Band Champion Jeff Owen. After high school graduation, Auret attended Park Town College in Johannesburg studying fine arts and design whilst holding down regular club gigs with his own band. He then transferred to the National School of Arts where he studied drums with Garth Farrant. During that time he started performing with other bands and artists as a freelancer, and also played in a student musical theatre production at the Cairo International Arts Festival and the Grahamstown Arts Festival in 1996. After college, Peter developed an interest in Jazz and improvised music. He was fast building a reputation as a Pop/Rock musician, gaining wider recognition with singer/songwriter Riku LÃ¤tti and the then South African Pop sensation Henry Ate (Karma), where he met future collaborator, guitarist Max Mikula. Auret and Mikula went on to record two SAMA (South African Music Awards) nominated albums with their Afro Jazz/World Music group Tsunami. Peter worked with Tsunami from 2001 to 2004, while also working more and more with local jazz outfits. In 2004 Peter's musical horizons expanded, when guitarist Jonathan Crossley booked him to play on a Jazz record featuring local jazz heroes: Marc Duby, Carlo Mombeli, Marcus Wyatt, Kevin Davidson and Sidney Mnisi. Peter continued to work with Crossley from 2004 to 2007, performing and recording on another album and a live DVD. This association led to Peter meeting pianist Roland Moses who would later become part of Auret's trio. In 2007 Peter joined South African Pop/Rock group Watershed, where he was reacquainted with bass player, James Sunney with whom he had occasionally performed over the years. "Turn the Tide" Reviewed by RadioIndy.com! 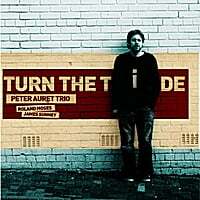 The CD, “Turn the Tide,” is the spectacular debut album by the Peter Auret Trio. This album is overflowing with stunning Jazz instrumentals with traditional and contemporary styles. Each song features bright and crisp piano, solid drums, and cool bass lines. The opener/title track, “Turn the Tide,” draws you into a relaxing mood as the smooth and silky melody flows with an easy moving pace. “Who Will Watch the Watchmen?” is another song that casts a palette of magical grooves as the piano ignites with a vibrant and bold Jazz melody. Feel the syncopated beats on the song, “Panorama,” as it grooves with an elegant and classy musical complexity. Fans of instrumental Jazz, featuring the piano, will really enjoy the wonderful album, “Turn the Tide” as these talented musicians are bursting with passion and flair.